Who is your best cosmetic dentist in San Francisco? Should he be accredited by the American Academy of Cosmetic Dentistry? Take a look here and judge for yourself. Dr. Rabanus specializes in smile designs with porcelain veneers and a variety of other esthetic dental restorations. He enjoys explaining the procedures and technical details, so they are easily understood by his patients. 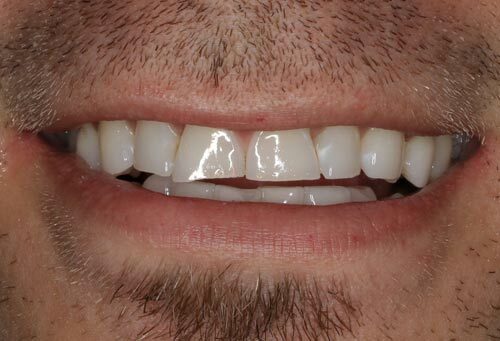 The "best" porcelain veneers look like natural teeth. Here you find everything you need to know about porcelain veneers and the various forms of smile makeovers. The principles of cosmetic dentistry that are applied by the best cosmetic dentists worldwide are explained in detail. From information about lumineers to porcelain veneer technology and design, you will find a variety of videos, including Patients' Testimonials, and information about smile makeover planning, such as the determination of oral function and how it relates to the design of tooth preparations and porcelain restorations. You might have heard about dental porcelain laminates, porcelain veneers, and lumineers. They are principally the same treatment modalities. You can find more detailed information on several pages about porcelain veneers, which you can link to from the navigation bar. You may have asked your dentist questions about how to get straighter and whiter teeth. You may have been referred to a cosmetic dentist. You might wonder who would be the best cosmetic dentist for your individual needs? Go to the navigation bar to find the answer. Cosmetic dentistry is a science. The term cosmetic implies something less than a science, but even the best cosmetic dentists find themselves constantly confronted with new dental materials. It is up to them to verify and decide which "state-of-the-art" techniques and technology are best for their patients. The best porcelain veneers are the ones that require a minimum of tooth preparation. They are the most requested cosmetic dental procedures today. Patients with any possible aesthetic dental problem commonly wonder if veneers can correct their concerns. The design, fabrication, and integration of any dental restoration into the patient's mouth involve an exact process of scientific applications and procedural protocols that make the smile designs of cosmetic dentistry durable and long-lasting. Why would you decide to get dental laminates? Dr. Rabanus explains the selection process and helps you to make an educated choice regarding your cosmetic dentistry procedures. While porcelain veneers and tooth whitening are the most common procedures offered by many dentists, you may not know about all the aspects that need to be considered to obtain not just straighter whiter teeth but also a permanently beautiful smile with natural-looking teeth, healthy tissues, and healthy oral function. There are a variety of dental materials for porcelain restorations and different ways to whiten your teeth. Everyone's teeth are unique and need an individualized approach. You will find many examples in this website. What are the attributes of a "top cosmetic dentist?" Advantages and disadvantages of different dental porcelains. Porcelain veneer or porcelain crown - What is the difference? What can a Smile Makeover do? Whiter, straighter, more beautiful teeth and healthy gums. The longevity of dental laminates. What does it depend upon? How long do they last? List of cosmetic dentistry terms. Most patients who seek Dr. Rabanus' advice exhibit significant wear of their teeth, which coincides with an older looking smile. They seek a smile rejuvenation. The simple placement of porcelain veneers in such cases should be avoided. Functional patterns of the masticatory system have caused the early breakdown of teeth as well as the premature loss of enamel, which make teeth look old and discolored. A smile analysis needs to be complimented with a functional analysis of the jaws and the teeth. 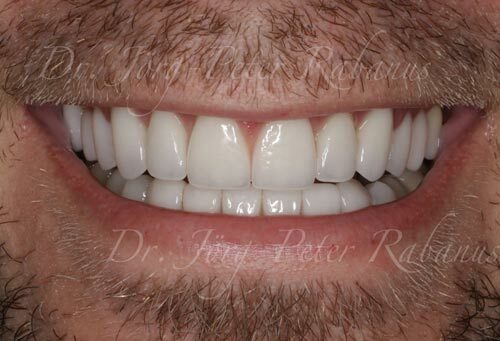 Provisional veneers are used to test the functional designs. Once comfort and aesthetics have been determined, the final porcelain veneers can be designed using the temporary dental restorations as references.